A review of “Sorry,” a tale of politics inside and outside a family, being staged by Thalia’s Umbrella at 12th Avenue Arts in Seattle. The Apple family’s strategy for discussing a difficult topic is simple: Talk about it as little as possible. On its face, Richard Nelson’s “Sorry” is a play about four siblings confronting the need to put their beloved uncle in a nursing home, but these characters are eager to change the subject, diverting from the matter at hand to discuss politics, their love lives, Regina Spektor lyrics, the tragic life of President Pierce — anything, really. Nelson’s script downshifts frequently, sidestepping potential dramatic bombshells in favor of slowly unspooling conversations, and the production from Thalia’s Umbrella, directed by Daniel Wilson, preserves that low-key naturalism. by Richard Nelson. Through Sunday, June 26, at 12th Avenue Arts, 1620 12th Ave., Seattle; $20-$36 (206-313-0257 or thaliasumbrella.org). “Sorry” is one of four plays by Nelson about the Apple clan, and all of them take place on a significant day. This one is set on Nov. 6, 2012, an election day that bears little of the excitement of the one four years prior for this liberal family. 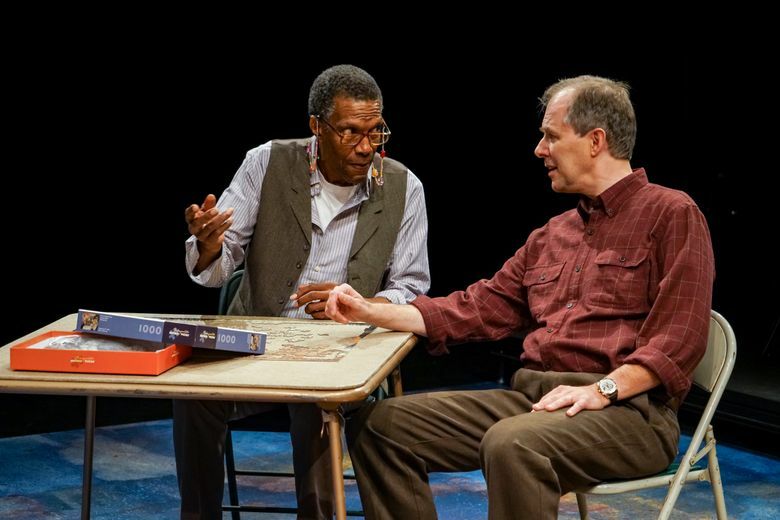 Setting a cycle of domestic plays on important historical dates (others include the 2010 midterm elections and the 10th anniversary of 9/11) seems like a setup for heavy portent, but much of the appeal of “Sorry” is its resolute ordinariness. This could be any day, with its stubbornly commonplace disappointments and tacit familial strains. The rapport among Thalia’s superb actors is authentically easy — and perhaps even more realistically, suddenly uneasy when someone chooses the wrong word or strikes a discordant tone. Teachers Barbara (Jeanne Paulsen) and Marian (Macall Gordon) live together in the small village of Rhinebeck, N.Y., where they care for their ailing uncle Benjamin (William Hall Jr.), a former actor beset by dementia. Jane (Leslie Law), a writer, and Richard (Terry Edward Moore), a lawyer, have come into town to help see Benjamin off to the assisted living facility and to provide some comfort. Barbara could really use some. As Benjamin’s primary caretaker, she feels the move most intensely, and Paulsen’s anxious performance is absorbing whether she’s speaking or not, the generally convivial mood of her siblings acting like a thousand tiny stabs in her wounded heart. The others have their own transitions to worry about. Jane is in a holding pattern in her career, while her boyfriend succeeds elsewhere. Richard, fresh off an assignment abroad, feels disillusioned about his job. Marian is attempting to move past a recent trauma and establish a new relationship. Here, among family, these are mostly background details. Nelson’s dialogue, which flows and overlaps and stumbles like real conversation, resists most exposition. The performances avoid easy characterizations too, as Moore’s pomposity, Law’s nonchalance and Gordon’s sarcasm are merely initial notes that deepen as the play proceeds. Best of all is Hall, whose Benjamin is written somewhere in the divide between plot catalyst and living, breathing human. The character spends much of the play lost in a fog of memory loss, but Hall ensures we remember there’s an entire lifetime of experiences locked inside this man’s head. In a play where some crucial things get left unsaid, it’s Benjamin’s unspoken moments that resonate the most.